There are few things I love more than dinner and drinks with friends on a Friday night. I recently met Susanne and her boyfriend Jay who are fresh off their move to Portland from San Francisco. They’ve only been here since July, but it seems like much longer, because I have enjoyed Suzanne’s company since the minute I met her. I knew that Mark would really like them too, so I arranged a little double date to kick off Maine’s First Annual Beer Week and try out The Thirsty Pig for the first time, which has been getting rave reviews from other Portland area bloggers. I may go straight to hell for saying this, but as much as I love beer, I have an extreme dislike for IPAs. I know, I know, people think I’m insane, but the hops overtake the beer and make them unmanageable for my taste buds. I much prefer a good porter or stout any day of the week over an IPA…so, when we arrived at The Pig and found only IPAs on draught for beer week, I was ready to just get up and leave. I knew Jay was going to fit right in with Mark and I when he confessed he didn’t enjoy IPAs very much either, because they, “bite back.” I thought this was the perfect description of what happens and the most obvious reason not to like them. After some discussion with our waiter, a tasting, and some serious coaxing, Mark and I ended up with New Guy IPA from Atlantic Brewing Company in Bar Harbor. Mark and I are huge fans of Atlantic Brewing Company and their Coal Porter is actually my favorite porter around, so it was only natural that we would be attracted to this IPA. I thought it was fantastic, not nearly as hoppy as many I have tasted, and it went down smooth. Suzanne also had the New Guy and Jay had the Lunch IPA from Maine Beer Company located in Portland on the Marginal Way, I think it bit him a little as he didn’t say too much about it. After we had some beers in hand we placed our orders and were told we could grab some peanuts to shell and eat while we waited. I could hardly think of anything better to do while waiting on house made sausages than eating peanuts and drinking beer. As Jay pointed out though, it was a little awkward as we all shelled our peanuts and made neat little piles on the table instead of throwing them on the floor, but since no one had instructed us on The Pig’s peanut etiquette (and there were no other visible patrons eating them so we could follow their lead) we stuck with our neat little piles and primly ate our nuts and swilled our beer over conversation of San Francisco, snow, and teaching Suzanne to drive a standard. It was filled with laughter and jokes, just how every Friday with friends should be. It didn’t take long before our sausages started arriving. 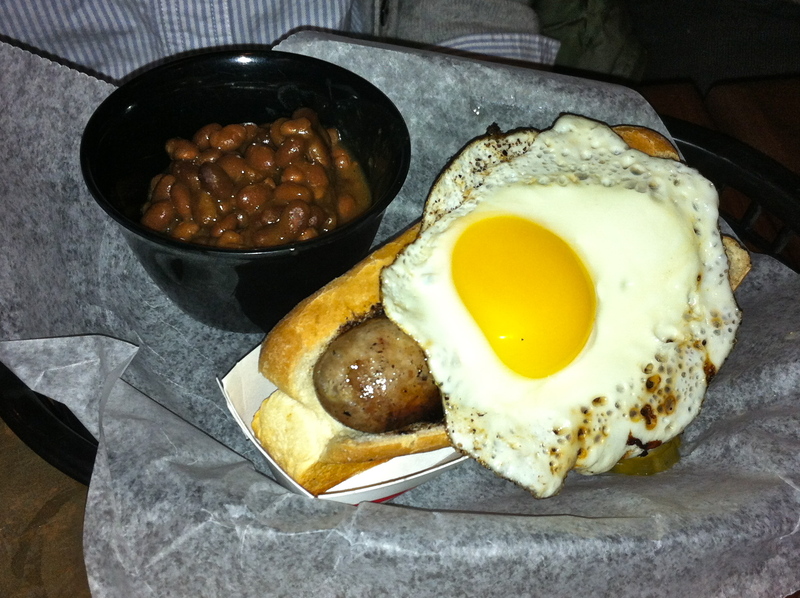 Suzanne ordered the daily special which was Bacon Sausage with a Fried Egg on Top and beans on the side. 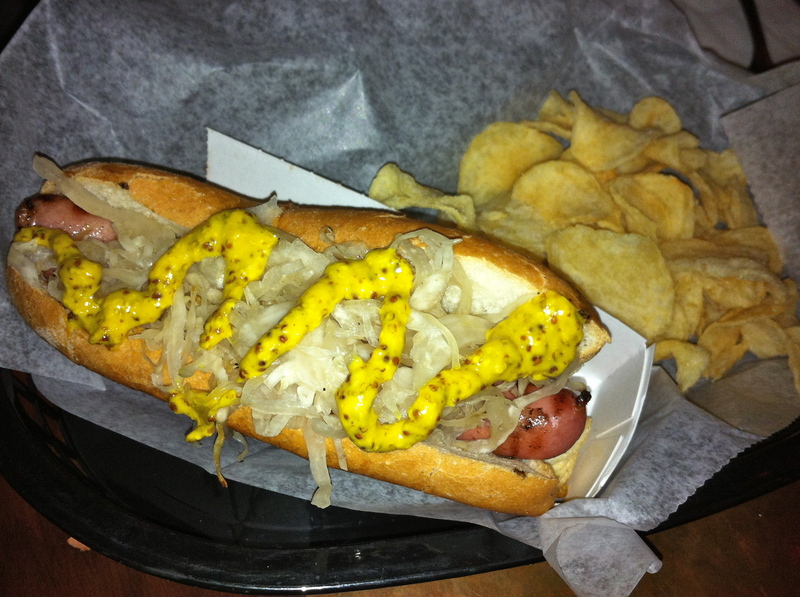 Jay went with the basic dog, an all beef dog topped with mustard and sauerkraut, with chips on the side. 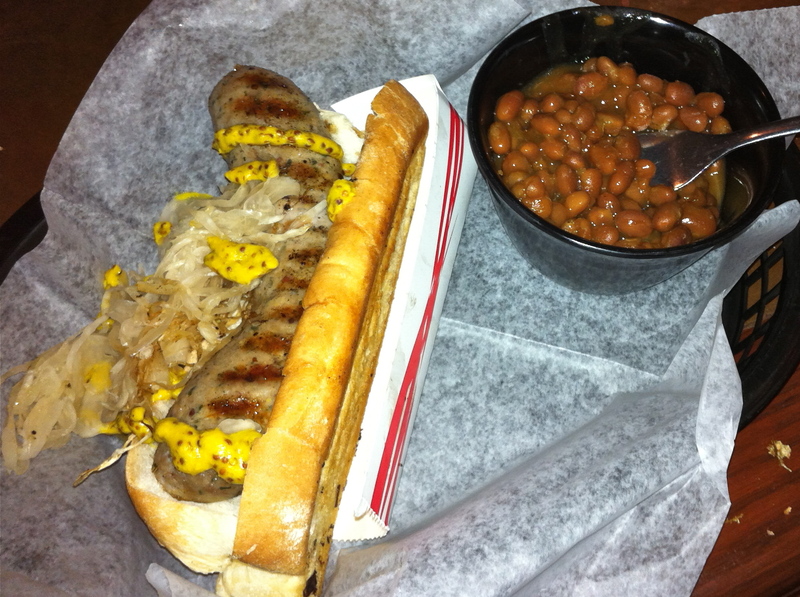 Mark went for the Lithuanian Kielbasa, a pork sausage with lots of garlic, parsley, and mustard seed steamed in Shipyard Export beer then topped with mustard and sauerkraut, with beans on the side. He raved about it and said he would definitely be having it again the next time we pop into The Pig. I deliberated over several menu items and actually ended up going with what was probably the worst choice—the Hot Italian Sausage. I am very particular about my Hot Italian Sausage since I grew up in an area where making a Hot Italian Sausage sandwich is an art form. This one didn’t quite live up to the standards set by the Italians in the greater Pittsburgh area. 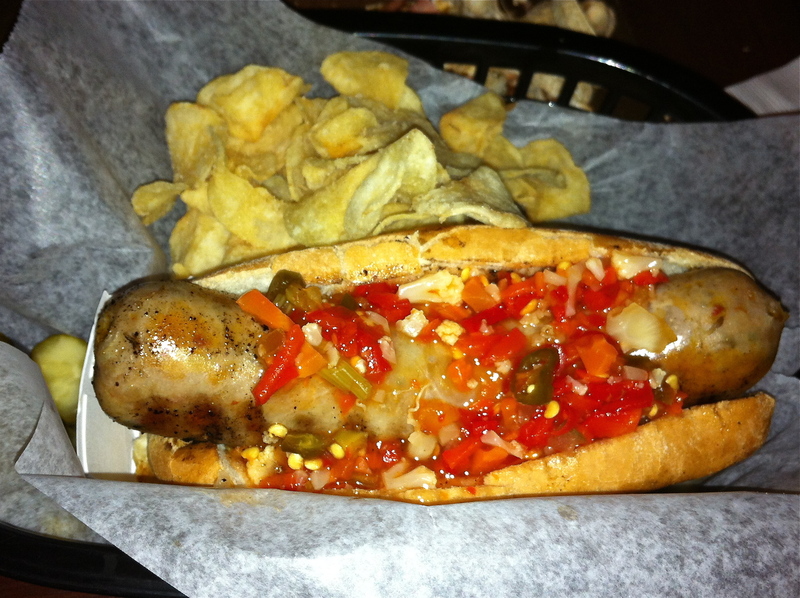 It was hardly what I would call hot, even topped with giardiniera, a “spicy” pickled pepper topping. This topping is most famously used on Italian Beef sandwiches all over Chicago (how did I bring up Italian Beef two posts in a row? I must be craving it or something?). It was all so extremely lackluster for me. Maybe I am not expanding my tastebuds enough that I was expecting the old and familiar Italian Sausage of yesteryear, but this just really missed the mark for me. I left sad, and my mouth wasn’t even on fire from the sausage to ease the pain in my heart from having something I love so dearly, butchered in the way that they have. I wouldn’t order that again. I liked the chips though, salt-n-vinegar. Those had to speak to me, since the sausage didn’t. *Sniff. All in all, it was a good experience. I never should have ordered the Italian sausage and the next time I go I think I will try the Greek Chicken (so many people have been raving about it). Now, to find some other places to take our artsy San Francisco friends to! I want them to love Portland as much as we do, and I’m sure with their great taste it won’t be a problem. My husband Mark and I were looking for somewhere to go on a Friday night that a) wouldn’t be overly crowded and b) was relatively inexpensive. We decided to go to Bull Feeney’s because our friend Alex is somewhat obsessed with it. We thought if Al likes it, it must be good…plus we were in the mood for some STOUTS! Upon entering we were greeted in the doorway and quickly ushered upstairs to our quiet two person table in a window overlooking Fore Street. It was great for people watching and we even spied our friend, Nate (Fore Front Fashion photographer), walking with his lady friend. In a city as small as Portland, you know you will ALWAYS see someone you know strolling about! While it was obvious when our waitress came to our table that she was new, she was eager to please. She fetched our beers and came back with a huge smile ready to take our order. Since Mark is religious for 40 days out of the year (Catholic Lenten guilt) he had to have something seafood related or vegetarian. 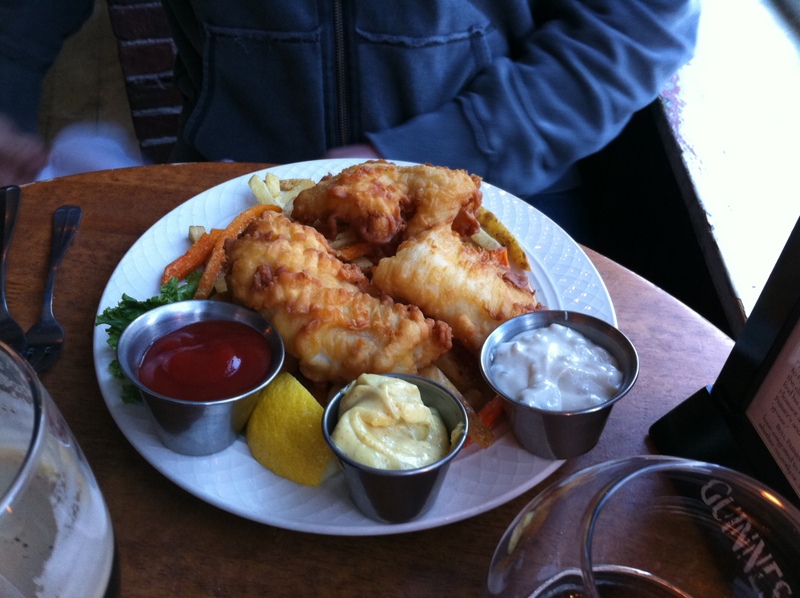 I am not even sure there was anything vegetarian on the menu aside from salads, but there was FISH AND CHIPS. 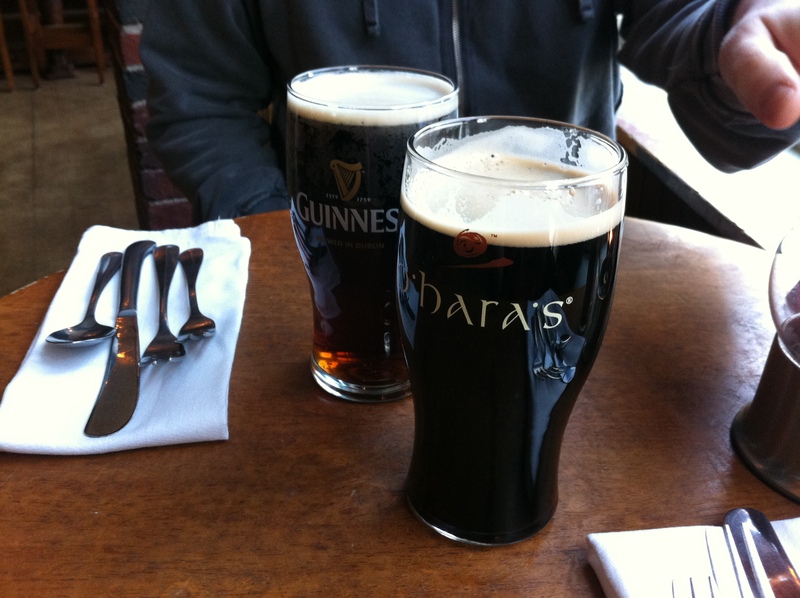 A classic, Irish and UK favorite…and also a favorite of Mark’s. He is a man who has no trouble sticking to routine, while I have trouble ordering the same thing twice, let alone going to the same restaurant twice. I am trying to work on this as maybe there is such a thing as ‘too much variety?’ So, deciding that I was in the mood for ‘variety’ and as a non-Lent participant I ordered the Bangers and Colcannon. Mark’s fish and chips ($15.95) came out expertly breaded, accompanied with a mixture of regular and sweet potato fries along with a size of cole slaw. He loved the breading and the fish was perfectly flakey and fresh. My plate ($12.95) came out with three large sausages covered in a delicious brown gravy with mashed potatoes that had sautéed cabbage mixed in with the mashed. It was, by all dietary accounts, completely unhealthy. I figured what the hey and threw caution to the wind and focused on how fantastic the food tasted not the fat and calorie content. It was the right choice because the sausage had great flavor and the casing added a nice snap upon first bite. I liked the mixture of the mashed and cabbage, it was different than I had imagined in a far better way. Overall, we thought the food/atmosphere at Feeney’s was great! We escaped with a $40 tab. It would have been relatively cheap had it not been for our $6 beers, so I think it’s worth giving a try. 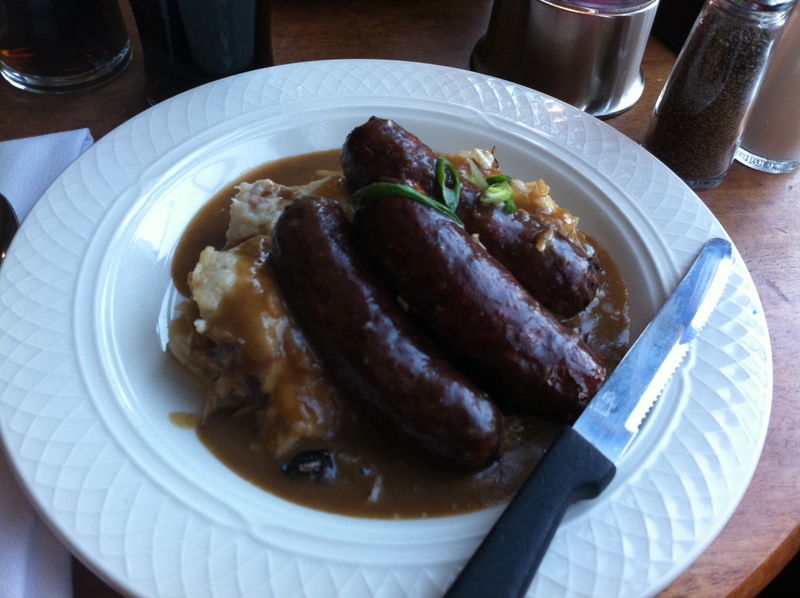 Though it’s far from authentic Irish food, it can satisfy one’s banger craving. It’s a cool place to grab some pub grub, have a good beer (because life’s too short to drink crap beer), and people watch. So, sometime do yourself a favor, go to Bull Feeney’s order an O’hara’s and some bangers…I feel pretty confident you’ll be glad you did.